YORK, Pa. (April 22, 2019) - It was a tough decision to make, but the end-result was worth the debate. Although the evening was delayed due to Mother Nature, things eventually heated up with Haas racing on to score his second top-five performance of the 2019 season. The York-native finished fifth during the 25-lap main event, battling within the top-five the entire distance after starting second on the feature grid. In fact, Haas owned the second spot the first 13 circuits. Haas finished second during heat race action to kick off his night at the Juniata County Fairgrounds. 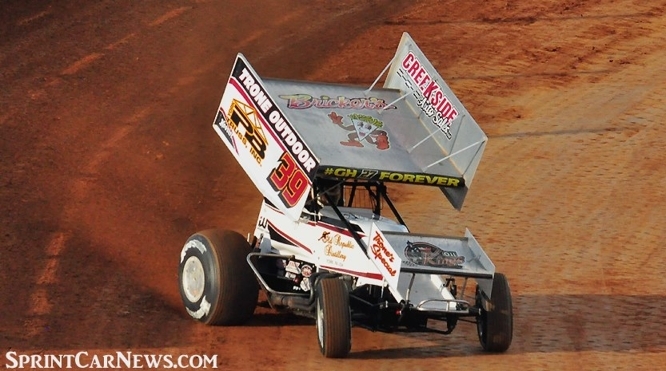 Cory Haas and Trone Outdoor Motorsports will continue their 2019 campaign with another action-packed weekend in the Keystone State. Although destinations have yet to be set in stone, the initial plan is to visit Williams Grove Speedway on Friday, April 26, followed by a return to the Port Royal ‘Speed Palace’ on Saturday, April 27. Follow Cory Haas on all of the available social media networks including Facebook: https://www.facebook.com/groups/665179853507583/. Keep up with Cory Haas online at www.fullyinjected.com, as well as at www.troneoutdoormotorsports.com. 2018 Highlights: Cory Haas earned his first top-five finish of the 2018 season on Saturday, March 17, at Lincoln Speedway in Abbottstown, Pennsylvania. Finished sixth during Lincoln Speedway’s Sprint Spring Championship. Earned victory at Williams Grove Speedway on Friday, April 6. Finished fifth at Lincoln Speedway on Saturday, April 7. Finished eighth during Walt Dyer Tribute at Williams Grove Speedway on Friday, May 25. Finished fifth at Williams Grove Speedway on Friday, June 1. Earned pair of top-ten finishes during action at Williams Grove Speedway (3rd) and Lincoln Speedway (6th) on Friday and Saturday, June 8-9. Finished second during Weldon Sterner Memorial at Lincoln Speedway on June 16. Finished third during World of Outlaws Tune-Up at Williams Grove Speedway on July 13. Earned two top-ten finishes during PA Sprint Speedweek. Finished third at Lincoln Speedway on Saturday, August 4. Finished ninth at Lincoln Speedway on Saturday, August 11. Finished seventh against All Stars at Lincoln Speedway on Saturday, August 25. Won Billy Kimmel Memorial at Williams Grove Speedway for a third time on Sunday, September 2. Finished 12th during 2018 Williams Grove Speedway National Open featuring the World of Outlaws. Earned back-to-back top-ten finishes at Williams Grove on October 5; fourth during regular show and sixth during Al Hamilton Tribute. 2019 Highlights: Finished tenth during Williams Grove Speedway season opener on Sunday, March 17. Finished sixth at Lincoln Speedway on Saturday, March 23. Finished third at Williams Grove Speedway on Friday, March 29. Finished ninth at Port Royal Speedway on Saturday, April 6. Qualified for Keith Kauffman Classic main event at Port Royal Speedway on Saturday, April 13. Finished fifth (started second) at Port Royal Speedway on Saturday, April 20.